Redwood Healthcare Staffing – Web Design | ASTRALCOM - Content Strategy, Conversion Marketing and Customer Acquisition. 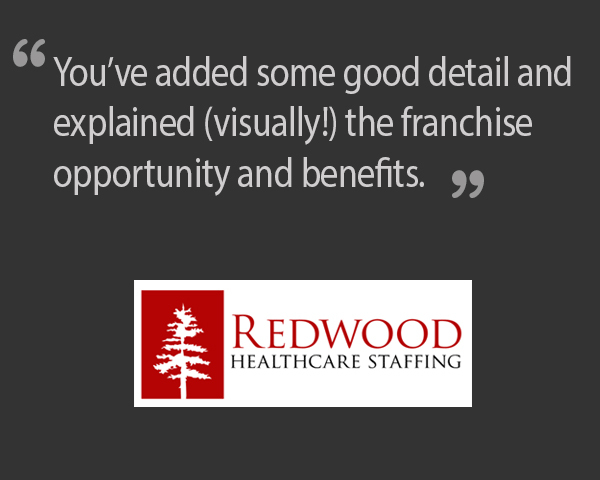 Redwood Healthcare Staffing – Web Design | ASTRALCOM – Content Strategy, Conversion Marketing and Customer Acquisition. Redwood Healthcare Staffing needed to improve their conversion rates from marketing efforts that funneled targeted traffic to a specific website landing page. With a 9-page pathway, this was something that was causing a lot of friction in the conversion process. So we “visualized” the process with some infographics as part of the website visitor experience and were thus able to shorten the customer experience pathway by more than 50%. Providing visitors with the right information, in the right context and at the right time, helps create prospects from visitors and the numbers show just that. Right after launch, we saw 52% decrease in bounce rate, a 192% increase in pages per visit and a 205% increase in conversions. Contact us today to explore ways to increase your conversion rates, too.